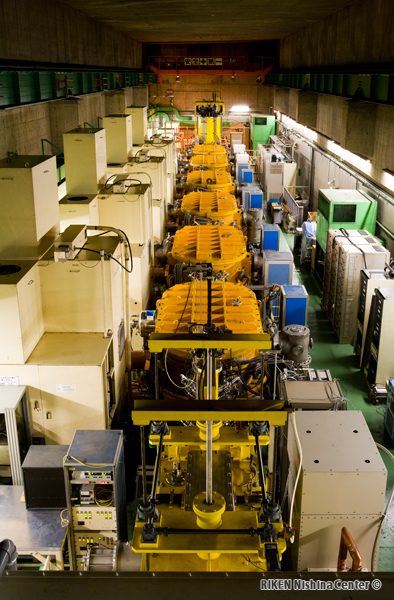 Researchers at RIKEN have discovered the 113th element that is heavier than any of the previously found elements. 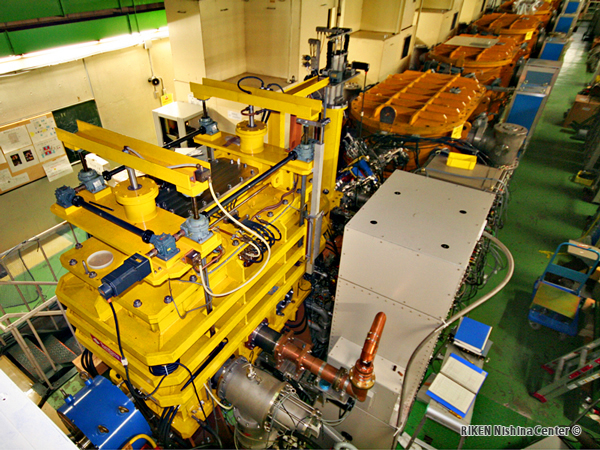 RIKEN’s heavy ion linear accelerator (RILAC) and gas-filled recoil isotope separator (GARIS) have enabled this discovery. The purpose of this research was to synthesize an element with atomic number of 113, which sounds simple; however, it was actually quite difficult in practice because the probability of producing the target element is extremely small. It was necessary to accurately predict beam energy optimal to this production and precisely apply the beam. To this end, the beam had to collide with the target nuclei many times. 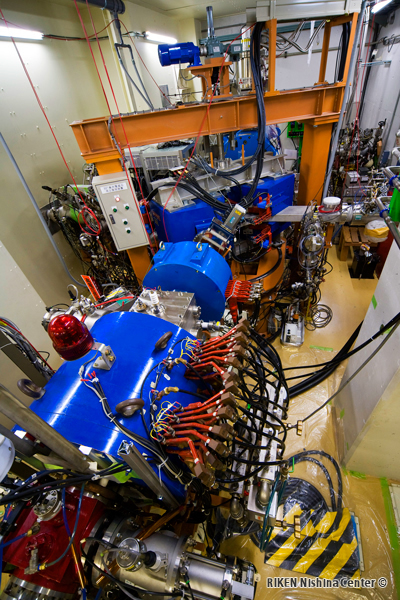 Zinc ions accelerated by RILAC collided with a bismuth target. We continued this colliding experiment for 80 days without interruption to produce a single event in which the 113th element was synthesized. Discovery of new elements is extremely difficult because the probability of producing the target element is extremely small. Researchers around the world are competing to achieve such a discovery. To obtain the 113th element, it was necessary for nuclei to collide with each other 100 trillion times. In addition to the above-mentioned RILAC and GARIS, various devices contributed to the discovery of the 113th element. GARIS can guide only the desired particles to a detector by removing high intensity injected particles and unnecessary particles produced in the reaction. 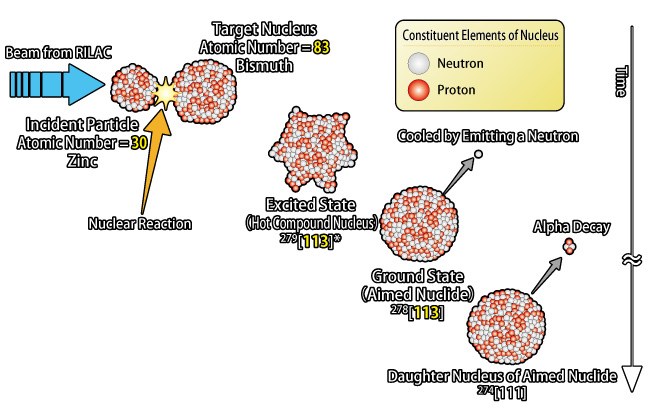 The detector can determine not only the energy but also the position of alpha particles and fission fragments to confirm that each reaction did, in fact, originate from a single nucleus. 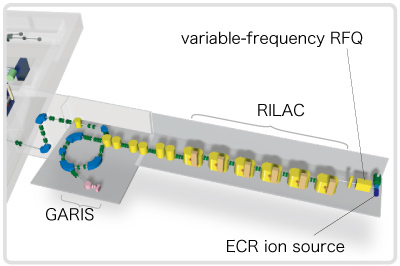 Successful development of an electron cyclotron resonance (ECR) ion source, which is a powerful beam source, in the front end of RILAC and that of a new type of a front-end accelerator called “variable-frequency RFQ,” placed between the ECR ion source, played a critical role in the stable delivery of the powerful ion beam. This tremendous achievement was accomplished using the integrated system of the upgraded injector and RILAC, which played key roles in this success, and other superb devices that the researchers designed themselves allowed us to earn our place in the periodic table of the elements. This newly discovered element must be approved by A joint working party of the International Union of Pure and Applied Chemistry and the International Union of Pure and Applied Physics before being added to the periodic table. To this end, researchers of the world including our center are currently trying to confirm the discovery. Elements thus far identified have all been discovered outside Japan. 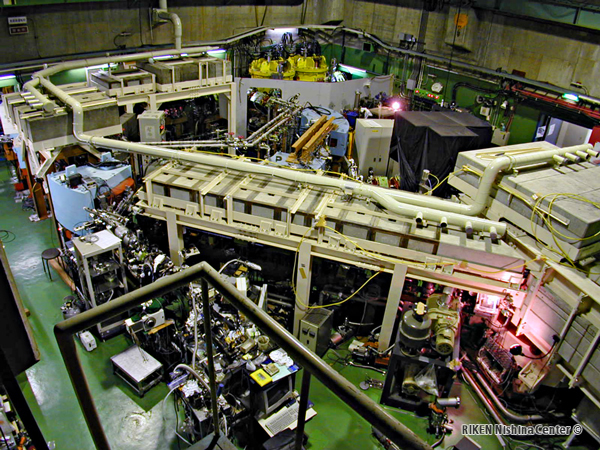 If this newly discovered element is approved, it will be the first Japanese discovery of an element.